Yibaneh Yerushalayim (May Jerusalem be Rebuilt) is a full color magazine geared to helping people set up a new home, after marrying or making aliyah to Israel, in accordance with authentic Jewish values. With a modern layout and printed on quality paper, it is produced to high professional standards. Its stimulating content includes informative articles by experts prominent in their respective fields and inspiring Torah tips, as well advertising offering quality products and services suitable for the publication's target readership. Distribution is currently free. Two issues, which were distributed in the Jerusalem area and throughout Israel, have already been published. The feedback had been extremely positive and it is clear that many people are very eagerly awaiting the third issue, which is now in an advanced stage of preparation. This issue boasts new features and many more articles. You can preview one of them: How Our Emotions Affect Our Relationships by clicking here. This magazine is part of our expanding Chesed ve'Emet organization that is engaged in disseminating Torah knowledge and values in various ways and in a wide range of chesed activities. In particular, the journal is a component of our Partners in Life program, which provides important services for people preparing to marry, both during their search for the right partner and for long afterwards. This also includes the Bayit Chadash project, which helps in a very practical way less privileged engaged and newly married couples (with a focus on empowering orphans) who simply lack the means for all that is essential for a new Jewish home. Couples we have helped in the past have found it difficult to find the right words to express their deep gratitude for this critical support. 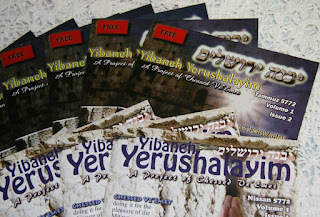 We have great plans for upcoming issues of Yibaneh Yerushalayim. We know that it fills a genuine need and has enormous potential for making a real difference to people's lives. But if we are to continue with this project, we are compelled to appeal to the generosity of those to whom the Jewish family as the cornerstone of Torah-based Jewish life is precious. As our publication is still new, potential advertisers - on whom we eventually will rely to meet the bulk of our publishing costs - understandably want to see that it will last and be effective before making a decision to advertise with us. Of course, this places us in a paradoxical predicament. Similarly, without basic capital, it is also difficult for a new publication like ours to attract the right calibre of sales people to solicit advertising. With your generous support, we hope it will be possible to publish our next issue very soon even without enough advertising. Your support will also give us the resources to expand distribution of the magazine, and this will in turn help to enable us to attract more and higher-paying advertisers. In order to make production as efficient and cost effective as possible, we will also need to invest in a computer that is able to handle the necessary graphic design software, as well as to purchase the software itself(Adobe Creative Suite) and other required accessories together. We will then manage to produce the magazine from start to finish on our own, with substantial long-term savings. In addition, we look forward to being able to update our current website making it user friendly, easy to navigate and enjoyable to use - packed with projects and information to assist our community. Please become a partner with us in our holy work! We do feel that our modest publication could play a not insignificant role in promoting authentic Jewish values, an important aspect of which is the stability of our family life. If you have a service or product related to weddings in Israel and setting up a new home here, please email us for prices to purchase adspace in our next edition. If you know anyone who loves sales, please have them email us.